Well, count yourself lucky if you live in an area where you can buy Jerky that has been smoked in a smokehouse ... there’s nothing better than real smoke to dry your jerky, but drying the meat with smoke is also a lot of work, and more work than most home-made jerky makers are willing to do. 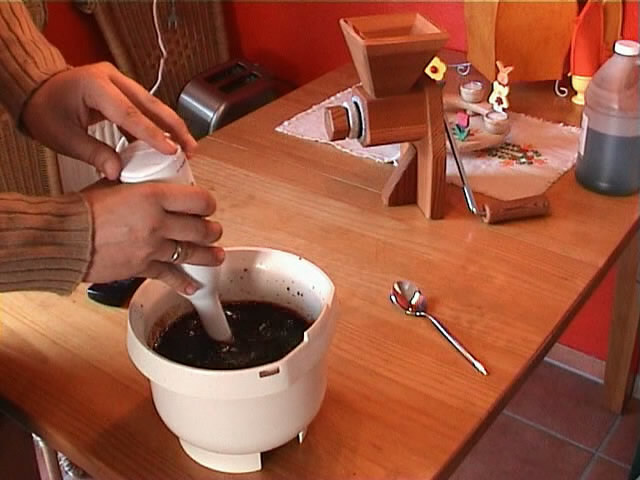 There are, of course, ways to dry jerky with real smoke, if you own a smoker grill or are willing to build yourself one of these things ... but it’s much more convenient to use a curing marinade and liquid smoke for your jerky, and that’s what I will do, too. You will have to cut the meat and marinade the slices for at least 4 hours (8-10 hours recommended) in the fridge. 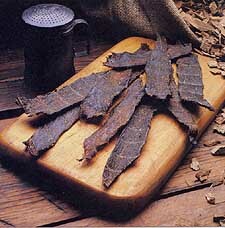 The ingredients of the marinade are, of course, the “key element” and define the taste of the Jerky. Basically, you can use almost anything to marinade the meat, but one important rule is that you cannot use any fluids that contain fat or oil! Fat will get rancid and spoil your Jerky afterwards! 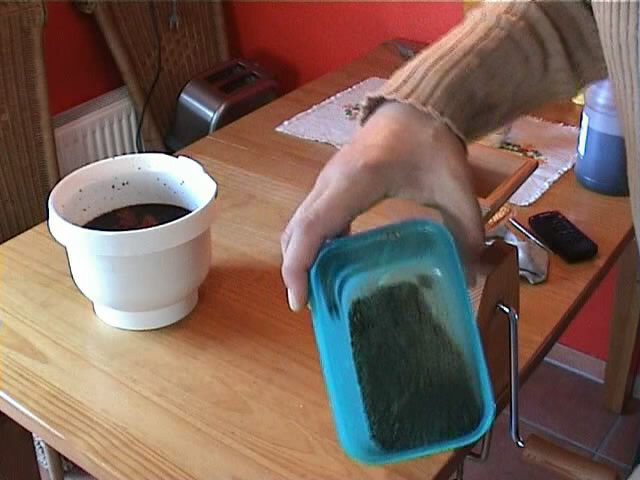 The meatures in the following recipe are calculated for 12 pounds of beef (my standard quantity when I´m making jerky) and have been converted from european metric values - so if you plan to use less meat you´ll have to reduce these quantities accordingly! "Spicy Stubbs Beef Jerky Marinade"
1.5 ounces (40 Gramms) of freshly ground black pepper - the more the better! If you like it Extra HOT, add a dash of your favorite Hot sauce or ground chillies to the marinade, but be carefull! This results in approx. 0,4 gallons or 50 ounces (1.5 litres) of marinade. The "secret" of my Marinade is the Stubbs Beef Marinade which gives the meat a very unique spicy flavor and a great taste. Please excuse the poor quality of those digital pictures, these are snapshots from a video I made. Now it’s time to add all other ingredients, including the solid stuff, too. You need to grind a lot of black pepper, so it takes a lot of time to do that with a normal pepper mill - it is absolutely NOT recommended to use already ground black pepper from the store. Please use solid pepper and grind it freshly! 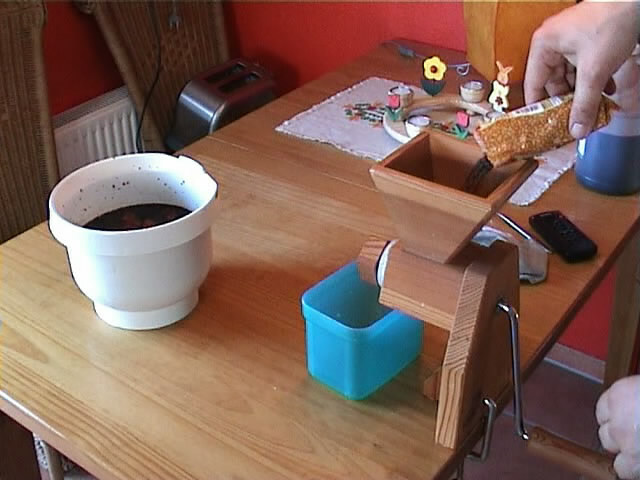 I use a flour mill to easily grind the black pepper - you can also use a big solid mortar to do it - do not grind too fine! It is better to use coarse ground pepper! ready in seconds !What a flavor! The dehydrated garlic and onion granulate do not mix very well with the fluids, so I use a small hand blender to mix all the ingredients together - it takes only two minutes and all the powder has dissolved in the marinade. Only a matter of seconds with the hand blender! Now the marinade is ready, well, not really. It takes a bit of time for all ingerients (esp. the pepper, onion and garlic) to give their flavor to the marinade, so it is absolutely recommended that you let the marinade set for at least 4 to 8 hours in a cool place! I always prepare the mariande one day prior to cutting the meat, so I can be sure to get a perfect result! 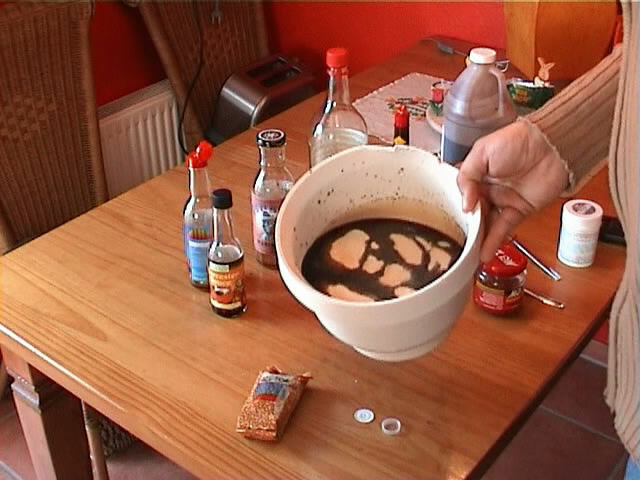 Be aware that all the solid elements in the fluid will sink down to the bottom of the bowl as it sets, so before actualy using the marinade please make sure to mix it again! Oh, one more thing, if you´re tasting the mariande you might get the impression that it´s maybe a bit too spicy or salty - well do not be alarmed, as long as you don not use any additional salt everything will be fine! We need a salty and spicy brine to give the meat a perfect flavor! 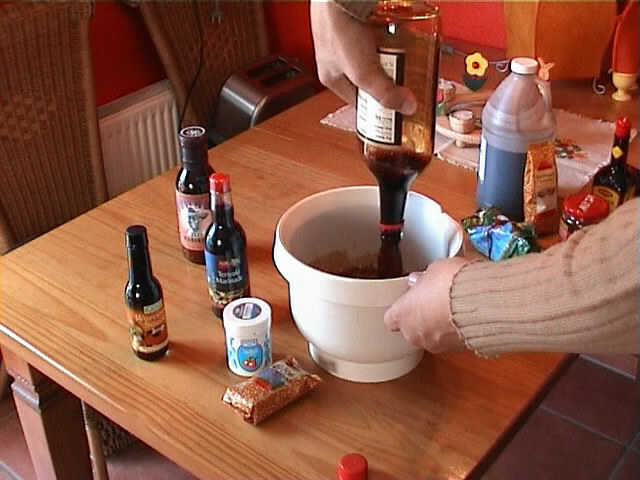 OK, now we´re set with the marinade, let´s take care of the MEAT now!